The Track is spring loaded and snaps together as it is unfolded. The Dolly with 13 feet (4 m) ofTrack can be set up in less than two minutes and will carry a video camera or film camera weighing up to 100 pounds (45 kg). 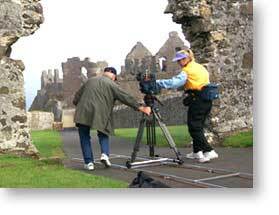 Silent, smooth, bump free camera moves can be accomplished much quicker than with conventional dollies and dolly equipment. The MICRODOLLY Camera Dolly System is precision built portable camera equipment for durability as well as ease of setup. AdditionalStraight or Curved Track can be attached in seconds. A wide array of Dolly accessories are available. Pads and shims included in the Kit help you set up quickly on uneven surfaces such as sand, grass or snow.